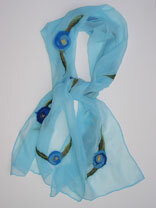 To make this scarf, first the leaves are formed and then the fowers are formed. To form the leaves gently pull 4" tufts of the roving colors for the leaves. Dip the pointy end of the leaves in water to keep the point sharp before placing on the gauze scarf. To form the flowers take 10" lengths of roving in two or more colors and create a flat spiral and place on the gauze scarf. The 10" lenghts of roving must be very thin and lightweight so the flowers felt to the silk and not themselves. Add a very small tuft of contrasting color for the flower center. The flowers and leaves were felted with a sander and then lightly fulled on a glass washboard.